There is no question that real estate has been one of the (5) primary sectors within the economy. Real estate speculation has been systemic. In effect, it was the inspiration behind both the South Sea Bubble and Mississippi Bubble of 1720. While I provided a forecast for real estate of the United States in the issue of November 15th, 2009, I have also written about the Athenian Real Estate Crisis and Speculative Bubble during the 4th Century BC in the October 2010 issue. Real Estate Bubbles often preceded serious economic declines. 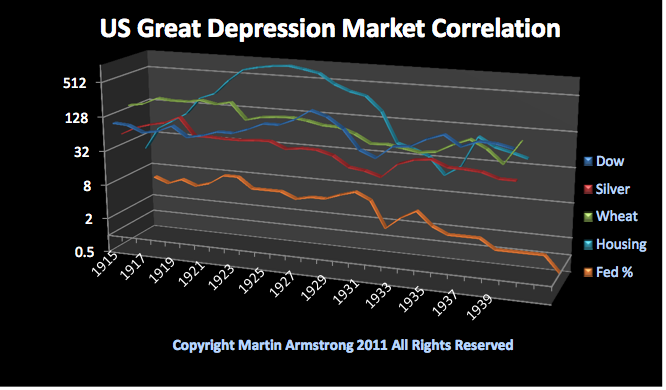 The US Great Depression of the 1930’s Market Correlation shows the layout of the various sectors. The commodities peaked with the Great Bubble of 1919 and generally declined into 1932. The stock market bubble was brewing headed into 1929 shifting from the Railroad stocks that peaked in 1907 to the first Industrial stock boom lead by the automobile industry. Howevever, you will notice the biggest bubble was in Real Estate (TOP LINE). The most famous Real Estate Bubble going straight into 1925 was the Florida Land Bubble. People were building places, selling them to other investors, while there really was nobody actually living in a lot of the places. That was no different than the Real Estate Bubbles of the 1790’s. Ed Note: This is the first two paragraphs plus Canada of a 33 page report analysing every significant real estate market in the world. Martin does all of the historical analysis going back 1000’s of years, and Petra Gajdosidova does the markets today. Go HERE to gain a per access service to Armstrong Economics specific forecasts for time & price. The Canadian housing boom shared some aspects of the US boom, including low (5%-10%) deposit and for a short period, no money down mortgages. The houshold debt to income ratio has continued climbing steadily for the last decade and is now at US and UK levels. The value of housing related debt in Canada has nearly tripled in the last decade to C$1.3 trillon (Bank of Canada). A large percentage of Canadian mortgages are insured by the Canada MOrtgage and Housing Corporation, i.e. the taxpayer (CMHC) insurance is required for all mortgages with less than 20% downpayment). While some Canadian cities offer reasonable affordability compared to household incomes, Vancouvers housing is, by any measure, highly overvalued and vulnerable to a sharp correction. Prices have risen 55% from their 2009 trough to a level 29% above their prior peak. The average home price reached nearly C$800,000 (according to CMHC). Strong Asian demand has provided a boost to already high prices. Thousands of mainland Chinese have moved to Vancouver (following the earlier waves of immigration from Taiwan and HK); thousands more invested in (mid-range to high end) real estate in order to park their cash in a stable Western country and/or to set their children up at Canadian colleges and with eventual Canadian citizenship, all driving prices to what are now clearly unsustainable levels. Advocates of government stimulus are running victory laps on recent developments that appear to vindicate their strategy. In particular, Paul Krugman compares the sluggish growth in Europe to the somewhat-less-sluggish growth in the US to prove that stimulus was more effective than austerity. Other economists are using government inflation measures to defend Fed Chairman Bernanke’s easy-money policy. The only problem is, they’re calling the race before the finish line is even in sight. As usual, Paul Krugman overlooks basic economics (which, despite his Nobel Prize, is a science about which Mr. Krugman really knows very little). The reason stimulus is so politically popular is that it appears to work in the short-term. However, appearances can often be deceiving, as they are right now in the US. Stimulus merely numbs the pain of economic contraction, as the underlying trauma gets worse. Austerity might slow an economy down, but at least the wounds are able to heal. America has chosen the former and Europe the latter, albeit not quite as large a dose as needed. The fact that in the short-run Europe is suffering more than the US does not vindicate Washington’s approach. On the contrary, this is exactly what is to be expected. What we’re seeing is like a race where each runner has a broken ankle. One has a coach who tells him to pace himself and not worry so much about winning this one, while the other coach gives his runner a shot of painkillers and tells him to give it all he’s got. Of course, early in the race, the doped-up runner is going to be flying down the track like nothing’s wrong, while the other runner might be limping at half his normal speed. However, when the drugs wear off, the sprinter is liable to collapse from pain, leaving the better-coached runner to limp across the finish line. The true test is not the immediate effects of stimulus or austerity, but the long-term results. For that reason, Krugman’s conclusions are meaningless. The apparent success of stimulus simply results from spending more borrowed money on government programs and consumption. But don’t we all agree now that this is exactly what caused the financial crisis in the first place? As far as inflation is concerned, a vindication of Federal Reserve Chairman Ben Bernanke is equally premature. First of all, it’s not that Quantitative Easing will lead to inflation; it’s that QE is inflation. Secondly, there is a lag between QE and rising consumer prices, so the jury is still out as to how high consumer prices will ultimately rise as a result of current and past Fed policy mistakes. But even more fundamentally, it is absurd to look solely at government price measures, which are built to understate inflation, and conclude that QE has not already produced an elevated cost-of-living. For example, the 2.4% rise in the Personal Consumption Expenditure (PCE) Index in 2011 is more of an indictment of the accuracy of the index than a vindication of Bernanke. In fact, of all the ways the government purports to measure inflation, the PCE is perhaps the most meaningless, as it relies on built-in mechanisms like goods substitution to hide a lower standard of living. As an example of how this works, imagine you are used to eating farm-fresh butter but have to switch to cheaper but also less-healthy margarine from a factory; the PCE would say you are no worse off. That’s exactly why the Fed chooses to use this uncommon metric. Mark Gertler, an economics professor at New York University, argues that even the Consumer Price Index, which rose at a more vigorous 3.2% in 2011, proves Bernanke’s critics wrong. According to Gertler, the CPI has risen at an average annual rate of 2.4% thus far under Bernanke’s tenure, significantly less than the 3.1% average under Alan Greenspan, and the 6.3% under Paul Volcker. However, Gertler overlooks two key points. First, the methodology used to calculate the CPI was much different during the Volcker era. If we still calculated the CPI the way we did then, the numbers would be much higher for both Greenspan and Bernanke. Second, given the huge economic contraction that has taken place under Bernanke, consumer prices should have fallen– significantly. The fact that they rose anyway indicates tremendous inflation. Of course, the Fed’s ability to stimulate the economy with inflation only works as long as bondholders remain ignorant of its plan. For now, the seemingly hopeful news reports are giving the Fed cover to keep stimulating. As long as the market remains convinced there is no inflation, the Fed can continue to create it. However, once the effects are so pronounced that even the PCE can no longer hide them, the Fed will be in a real bind. Think of our two runners again. Even after the race is over, the fellow who chose to dope up likely injured himself even further. He might have even ended his career. So, the early dash and the cheer of the crowd in that one race was clearly not worth the many years of misery he would incur in the future. Regardless of what the triumphant Keynesians would have you believe, my analysis continues to be that the current combination of monetary and fiscal stimulus is driving us toward disaster. 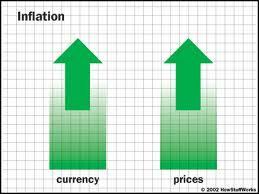 Instead of a real recovery, the US will experience an inflationary depression. Europe, on the other hand, will suffer much less, precisely because it was not seduced by the short-term appeal of stimulus. For an in-depth look at the prospects of international currencies, download Peter Schiff’s and Axel Merk’s Five Favorite Currencies for the Next Five Years. Subscribe to Euro Pacific’s Weekly Digest: Receive all commentaries by Peter Schiff, John Browne, and other Euro Pacific commentators delivered to your inbox every Monday. The key dilemma around Moneyball, the book by Michael Lewis and the movie based on it (I recommend both), is pretty simple. Beane realizes he can’t look at the player acquisition game the same way the Yankees do and win. He has to figure out a different way to find winning players. Fortunately, he meets Peter Brand (in real life, Paul DePodesta, who didn’t want his name used in the movie version), who introduces him to a set of ideas the rest of baseball ignores. While other teams focus on apparent athletic talent, Brand focuses on how teams actually win. Teams win by creating, or preventing, runs. Using statistical methods, Brand focuses on players that create runs — instead of how fast they run, how far they can throw, or how far they hit the ball. Of course, the A’s become winners on a low budget with overlooked players. They set an American League record winning 20 games in a row on their way to an impressive 103-win season. You can probably already sense how this is relevant to investing. Whether you realize it or not, you are in a position a lot like the A’s — maybe 100 times worse. The financial markets are probably the most-competitive field of endeavor on the planet. There is a lot of brainpower and financial muscle trying to “win.” You need to look at the market differently to beat it. Beane looked for ballplayers who created runs based on the theory that runs win ballgames, instead of focusing on obvious athletic ability, which is what everyone else was doing. Over the long haul of a 162-game season, the odds would pile up in his favor. Likewise, in the market, we want stocks that create shareholder wealth, on the theory that stock prices will follow. This is an important, if basic, insight. We don’t want to look for high dividend yields or low price-to-earnings ratios or good-looking stock charts or any of the superficial things everyone else focuses on. “Everyone else” is a lot like the old baseball scouts that focus on how fast a guy can run or how well he throws — or even if he has a pretty girlfriend. (From the movie: “He’s got an ugly girlfriend.” “What does that mean?” “Ugly girlfriend means no confidence.”) These attributes have little to do with whether a guy can create runs. In the same way, the glamour statistics and charts alone don’t really get at wealth creation. Wealth creation is ultimately measured in the ability to create cash. 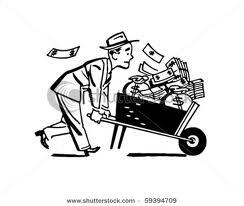 Cash, though, comes from all kinds of sources — rising asset values, sales of assets, earnings, dividends, etc. — ultimately reflected in stock prices. In markets, one of the best predictors of wealth creation is ownership by the people in charge. Hardly anyone focuses on ownership. Ask a CNBC talking head how much stock the CEO owns of his favorite play? He won’t know. Heck, ask most fund managers how much skin their management team has in the game. They won’t know either. They don’t look for it. And that is your opportunity. Due to this vested interest factor, these management teams often prioritize the creation of long-term shareholder value and, as a result, outperform the markets. To get in the Wealth Index, a company must meet several criteria. One is simply that there must be a wealthy individual in a position of control (e.g., chairman, CEO). Wealthy means at least $1 billion in personal assets, as measured by public data. So the members of this index are, essentially, a list of companies with a billionaire owner-manager. Not surprisingly, the index includes six current holdings in my Capital & Crisisnewsletter, including Federal-Mogul (FDML), which counts legendary investor Carl Icahn as its majority shareholder. I think it’s going to be one of the market’s top-performing stocks over the next few years. Having owner-operators with a track record is critically important if you are a long-term investor. As Warren Buffett pointed out, “After 10 years on the job, a CEO whose company annually retains earnings equal to 10% of net worth will have been responsible for the deployment of more than 60% of all the capital at work in the business.” Talk about having an impact! It’s a simple thing, yet nearly all the financial world’s eyes focus on everything but this. By focusing on this pool of Wealth Index companies, you vastly increase your odds of success — as the table above shows. You can do the same in the stock market by limiting yourself only to companies that exhibit one of the chief characteristics of wealth creation: significant ownership by the people in charge. Editor’s Note: Chris’ insights are among the most valuable and time- tested we can think of. Subscribers to his Capital & Crisis newsletter know that better than anyone — it has one of the highest renewal rates of any Agora Financial publication. That means when people sign up for Chris’ advice they aren’t just taking it…they’rekeeping it; knowing they can rely on it when they need it most. Click here now to find out why they find this service so invaluable. 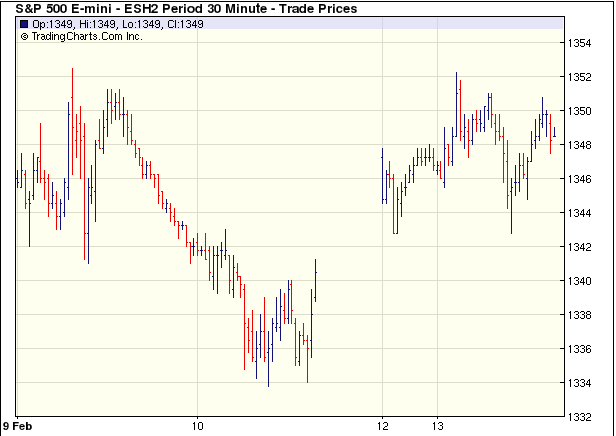 For the first time since the last week of December of 2011, the S&P 500 Index closed lower on the weekly chart. Recently I have been discussing the overbought nature of stocks based on a variety of indicators. However, the real question that should be asked is whether last week was just a short term event or if we see sustained selling in coming weeks. The Dow made another post-financial crisis rally high Thursday as it approached the 13,000 level. To provide some perspective to the current Dow rally that began back in early October 2011, all major market rallies of the last 111 years are plotted on today’s chart. Each dot represents a major stock market rally as measured by the Dow. As today’s chart illustrates, the Dow has begun a major rally 28 times over the past 111 years which equates to an average of one rally every four years. Also, most major rallies (78%) resulted in a gain of between 30% and 150% (29.8% to 150.5% to be exact) and lasted between 200 and 800 trading days (9.5 months to 3.2 years) — highlighted in today’s chart with a light blue shaded box. As it stands right now, the current Dow rally (hollow blue dot labeled you are here) would be classified as well below average in both duration and magnitude. To subscribe to Chart of the Day go to the http://www.chartoftheday.com and sign up.